With almost 1500 kilometers of coastline, Galicia and its Rías (estuaries or bays) are home to almost 700 beaches! Galicia’s many coves and beaches are a fantastic place to relax after your journey along the Camino de Santiago. If you are walking the Camino de Santiago in Summer time and have a few of days to spare, venture to the Galician coast, you will not regret it. The Galician Rías are divided in two: Rías Altas (higher estuaries in the North) and Rías Baixas (lower estuaries, in the South). The best way to access the beaches of Galicia, particularly those not in towns, is by car. However, many coastal towns enjoy decent urban beaches within walking distance, if you are travelling by public transport and you are only craving a swim in the sea and a coastal town atmosphere. O Grove region has 10km of sandy beaches. Here you will find A Lanzada, one of Galicia’s most famous beaches, 2.5km long and divided in three stretches.The waters and waves of the Lanzada beach are meant to have special powers, linked to fertility. O Grove is also home to the island of A Toxa, famous for its thermal waters and home to health spas and hotels since the 1800s. If you are finishing your Camino de Santiago in Cape Fisterra, then you are right in the Costa da Morte (Coast of Death), a stunning region with pretty coastal villages, tasty seafood and fantastic strands. Mar de Fóra is a popular spot for pilgrims and while stunning, this is quite a dangerous beach for its under currents (swimming is usually not recommended); there are other stunning beaches nearby where you can swim, for example the 2km blue flag Praia Langosteira. If you are walking the Camino de Fisterra to Muxía, Praia de Lourido, near the village of Lires, is an idyllic spot for a swim in the blue waters of the Atlantic. Further South, the town of Carnota has truly exceptional beaches, such as the 7km long Praia de Carnota with its bird nature reserve, Boca do Río and Mar de Lira. Carnota is also home to one of Galicia’s longest granary (horreo). Near the town of Riveira (65km from Santiago), you will find the Dunes of Corrubedo National Park, a stunning protected natural area. As part of this nature reserve with virgin beaches, you will find the Praia do Vilar/Carreira (70km from Santiago). Noia is probably the closest town and beach to Santiago de Compostela. Noia, only 36km away, has often been referred to as ‘Santiago’s beach’ and is a lively town. Nearby, you can find Portosín and Porto do Son, smaller towns further along the coast, all with their own pretty beaches, such as Aguieira and Baroña (with its ‘castro’,the site of a Celtic settlement). Compostela Beach in Vilagarcía de Arousa is only 45km away and can be reached by train, approximately 30 min from Santiago. However it is a town beach, after all. Nothing too exciting. 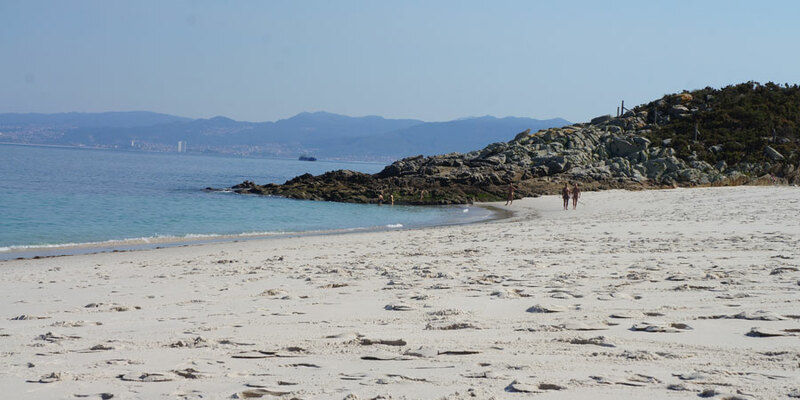 However if you cross to the island, Illa de Arousa, you will be rewarded with beautiful sandy strands. The group of islands called Cíes form the so called Atlantic National Park. The islands (Cortegada, Sálvora, Ons and Cíes) are an unspoilt nature and bird reserve, accessible by ferry from the city of Vigo. Scuba diving and camping permits need to be applied for in advance, when travelling to the islands. If you’d like to venture further afield, into the Rías Altas, you might want to visit the Praia das Catedrais in Ribadeo on Camino del Norte – the Northern Way, the Cathedrals Beach. This beach, with its majestic rock formations has been declared a National Monument and chosen one of the most beautiful beaches in the world by TripAdvisor in 2013. Beware, it can only be accessed with low tides and crowds visit the beach specially in July and August. 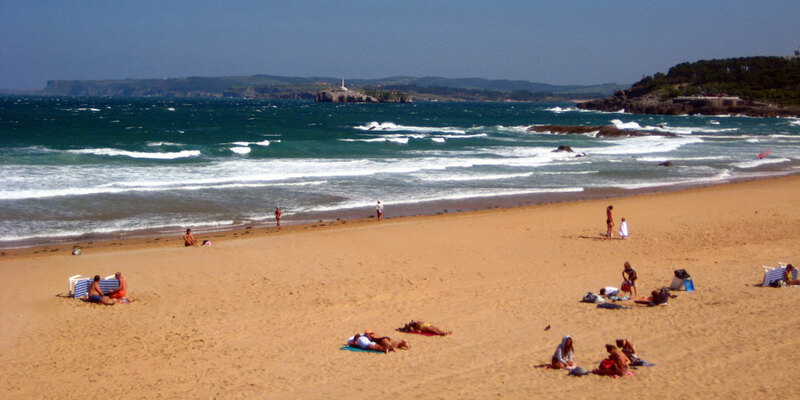 Along the Rías Altas, all the way from Ribadeo to A Coruña, you will find stunning blue flag beaches and coves too. If you are not in a rush to get back home, it is worth exploring the North Coast of Galicia also. -If you can, go to explore beaches outside towns, they are usually much better quality and much more beautiful. -The beaches more exposed to the Atlantic tend to have colder waters for swimming. The Rías Altas in the Cantabric Sea will have, in general, warmer swimming waters. -Always respect swimming areas and pay attention to the flags, for your own safety. -Respect the environment and use plenty of sun cream to protect from the rays. I am leaving for the Camino in two months and was hoping to head to the coast after I finish. This has been the most helpful article/video I’ve found – thank you!